Whenever I’ve been to Taiwan or Hong Kong, I’m reminded of the solitude of being a western drinker. In tea hotspots out east, you learn about teas by drinking with other people, shop owners, hobbyists, etc. You can explore different tea shops, drinking and talking about tea with other people. And while there’s plenty of writing online about different teas, tea as a hobby is a very social and interactive experience. In the west, most of us more closely resemble crazy, gongfu hermits. Outside of a few assorted tea shops there’s not really much tea culture in America and Europe that resembles east Asia. We may occasionally read an article online or watch a video, most (or all) of us do our gongfu sessions by ourselves or if we’re lucky with one other person. This presents some dangers in how we are developing habits and acquiring knowledge. We’ve received emails from a fair amount of gongfu drinkers that they like watching our videos because it gives the feel of drinking with other people. This is on one hand affirming but it is also sad for the reasons stated above. Discussion is a very important part of the learning process to talk tea with other people and get exposed to different ideas. Always drinking by yourself isn’t inherently bad, but can lead to unusual and sometimes bad habits. If you’ve read all the forum posts, B&B thread, all the blogs, seen every single TeaDB video (NERD), that’s great! Still, all those hours online can only take you so far. Tea is a social drink and drinking by yourself and watching two guys online is not a substitute for actually drinking with others.. If you’re in a coastal, diverse urban center, there’s probably more people out there like you. Get connected to some local tea folk. This is one area, where I’m fortunate and privileged (for someone living out in the west). I live in a fairly multi-cultural area with a few other gong-fu drinkers I meet with semi-regularly. When I was in Taiwan, I visited a shop with a bunch of traditionally stored pu’erh that originated from Hong Kong. The shop owner pushed his tea hard brewing using a large (~250ml?) pot for two people and made big, thick and dark cups that still had a good deal of bitterness despite the tea’s storage history. Another vendor used a gaiwan eyeballed a pile of leaf (old oolong) and brews the tea hard, skipping the rinse. The tea turns out strong, full and depending on the tea a bit tart. A third vendor, also selling traditionally stored pu’erh, uses much less leaf and brews two or three teas concurrently using the same parameters for each tea. We then drink the teas in sequence, brew by brew. After buying tea from these vendors and bringing them home and messing around with my own brewing parameters, they unsurprisingly turn out differently than the shop. None of these brewing techniques are inherently bad or inferior, but they are different and inform you of different characteristics of the tea. Brewing matters.. And one way that we can really get set in our own ways and develop bad habits is our brewing. Drinking with people usually means that you’ll experience and drink from other people’s setups and their brewing. Getting exposed to different ways of brewing tea is a good thing! How you make tea is one of the most impactful things about how the tea actually turns out. While it can be good to use relatively stable/steady parameters, if we haven’t seen others brew tea and tried it for our self our experiences are very limited. If you’ve been to teashops in Asia, most people/vendors brew a little differently, some significantly and if a vendor is brewing and you’re trying to evaluate the tea for purchase you should have some idea about how the cup of tea turned out the way it did. Is it the tea or how it was brewed? How many leaves were used for the brewer? Was the tea being pushed or being brewed closer to competition style? How potent were the brews? Sampling a variety of teas with an open mind is an important part of the learning experience. Similarly, seeing how experienced tea people make tea and thinking about it with an open mind is important, something that is missing from most western gongfu’s lives.. While personal preference towards brewing shouldn’t be completely discredited, it is also easy to get into some unusual habits in how we make tea.. If you’re making gongfu for one all the time you’re probably not alone! Go out there and find someone besides your significant other to drink with. It’s fun and you might learn something. I appreciate the view, but I am not convinced tea “out east” will bring me anything I need. I don’t think I need to fly around the world to experience the joys of a skipped rinse or double parameters. I don’t think I need the week of Pepto just to prevent further miseries of old age, my health and bowel issues exacerbated just to have tea “out east.” It’s a nice idea in theory, maybe for the young and healthy. For me, a far better experience can be had in unique teas sent to me every week from tea friends who have cakes that cannot be bought anywhere no matter how far I fly. Appreciate the points. I actually wasn’t trying to suggest that people should travel to Asia. Even though I love doing so I don’t think it’s a practical solution for most, pending people’s life situation and finance. Was trying to bring up the isolation of western drinkers. A talking point! May I recommend Trappist Monk Thomas Merton’s “Thoughts in Solitude?” Part 1 and Part 2. These of course were written before his trip to Asia and the fatal pulling of a metal light bulb cord upon exiting a shower in Thailand. Despite that, the tea was probably good. That particular attempt at acquiring some paperless on the cheap did indeed have a tragic ending. And it’s why I never wash. However, if I recall correctly, the first volume (of the meditations you are referring to) is called “No man is an island”. Also, wasn’t Mertons main message one of reaching out across the void to other people, faiths and cultures…? I’d say Brother Thomas probably is on James’ team here. But then again, maybe I have just grown wise in my own eyes from too much thinking (and drinking) in solitude. Indeed, however Father Merton was a cloistered Cistercian monk who asked for, and received, special permission to live as a hermit within his own community. While he valued community fully, most of his time was spent in silence and alone, and the value he found in others is from the perspective and the calling to solitude. Thank you for this post! I find a tea friendship is one of the most meaningful friendships I can have. I’m lucky, sitting in Floating Leaves twice a week brewing tea for people I get to drink tea with all different kinds of folks. Met some really wonderful drinkers over time. I do love my solitary sessions, but the best I’ve had are with others. I’ve heard it said, in very Chinese fashion, that each person sharing a tea with you — really sharing the experience of the tea — amplifies the experience by 10x. Not very scientific, but the sentiment is important to me as a tea person. I really appreciate this write up! Living in Arkansas, I often feel like the only gong fu enthusiast in the state. For that reason, the internet has been such a useful tool for connecting me with other tea drinkers, and enabling me to learn about other people’s tea experiences. For many of us (especially in the Midwest/Southeast), it seems as though beginning to develop or further tea culture in our own regions is an obstacle that we must go through. I’m in Louisiana and I feel the same way. I appreciate your comments, James. I am 99.9% a solo tea drinker and no matter how much I proselytize, I can’t seem to convert anyone to even being a semi-serious tea drinker. Some of my work friends will join me for a session but even though they love the experience, they quickly revert to their bags of Numi or Harley’s. 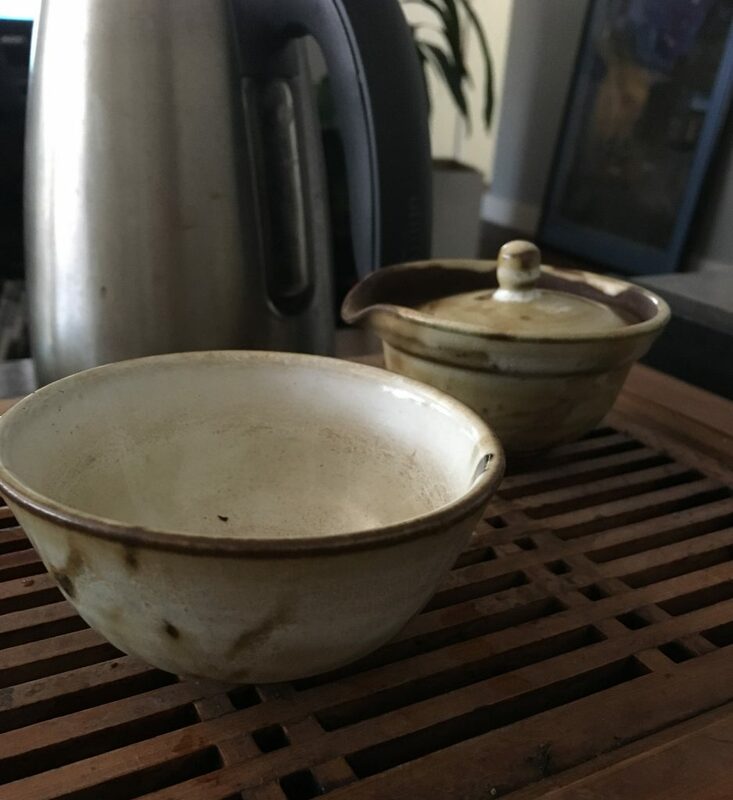 Like others, I’ve had to be an autodidact–thankfully, you, Scott at YS, and a few others have helped to bring pu-erh education to the “masses” so that we can further our obsession. Hello, I agree with you however circumstances often don’t permit me to be as sociable as I would want, regarding puerh. Especially living in a place that requires the acceptance of 95% of the planet e.g. boba tea and fro-yo. Secondly as for trying different brew perimeters I think that is up to the individual. Most people do things the way they want, either brewing the same way or different ways. There is a reason why it’s called gong-fu, however a person practices, will yield results. It is a reflection of who ourselves are and they way we approach it is mirrored from within. I couldn’t possibly agree with you more on the disadvantages of living in the west when it comes to drinking tea socially. Living close to London I have asked time and time again people if they would like to meet and drink some tea and nothing has come through. Sometime ago there was someone trying to organise pu’er drinking London meetings in the Facebook’s Pu-erh club and I offered to join them. Not hearing anything for a while I ask if anything had come of it. Once again I never heard anything once again. Now I am trying to organise a tea meeting or two with a tea dealer who lives further afield. Wish me luck. Good luck Rui! I’m amazed there’s not more gong-fu going on in a major city like London. Hope you can find something. You only want company when u start out. After a couple of decades you’ll end up drinking alone again or with just one or two friends. I do big tea parties maybe once every 2 years ?? In Asia though , the tea culture is much much more than gong fu. We drink in coffee shops , slurp it up by the gallons with our dim sum , n local labourers carry a canteen of it n squat down during breaks to gulp it down , it is a part of everyday life. A trip to Menghai City during the Spring Festival is probably an experience that lends itself to the desire of drinking alone. Its a crazy time of long drinking sessions; think Glastonbury without the music but lots of different teas and lots more unscrupulous and questionable behaviour. If you want any reason to keep things small and solitary then this is a good experience to inform this. Scott talks wisely about this idea of taking pictures and posting it on social media as proof of an “experience”. I think its too often the case there is focus on this idea of the experience to be recorded and documented rather just enjoying the tea with respect to the tea and your social environment. I’ve witnessed enough too many “tea events” when someone decides to take pictures or people reach for their phones to record the experience, when in fact the experience is actually destroyed by such interjections. There is a subtle difference between sharing and discussing experience than consuming and collecting experience. I enjoy TeaDB precisely because the platform provides for discussion and the video blogs for sharing, rather than consumption and collecting “tea experiences” that far too often becomes removed from enjoying the tea for the tea itself. Great article. I’m a solo drinker most of the time as well but I’m always trying to teach people about tea. My last semester at SDSU I was fortunate to have met some really awesome people that love tea. We’ve been organizing tea sessions and it makes me incredibly happy to share with everyone. Right now I’m waiting for one of those friends to come back from China (he’s visiting family). I’m excited to see what teas he’ll bring back! San Diego tea meet up? I think he meant South Dakota State University. Thankfully my wife is also a tea enthusiast and we have some (Chinese) friends that we occasionally drink tea with. However, I would like to be able to visit local tea houses to drink and chitchat (rather, tea-chat) in a public environment. Though there are a few tea-houses/shops where I live (Stockholm, Sweden) I have a bit of a problem with the price markup. Maybe I am just being cheap, and I understand a tea-house/shop have more bills to pay than online vendors, but when I see the same teas I can buy online for four or even five times the price, then I rather stay home and drink better tea. It would be a different matter if said tea-houses found unusual teas that I can’t get anywhere else (I have visited a fantastic tea-shop in Munich, Germany that imports rare Taiwanese oolongs), unfortunately no such store is available over here. The local tea-houses mostly seem amateurish in that they import rather pedestrian teas and sell them at ridiculous prices. Too bad because I would like to have a tea-place to hang out in.